Can Drinking Moonshine Really Make Me Go Blind? The short answer: yes, it’s possible to go blind from drinking moonshine. But it’s also possible to go blind staring at the sun. When consuming alcoholic beverages of the DIY variety, the important thing is to let common sense be your guide. 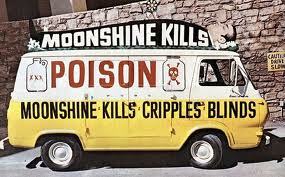 The idea that moonshine or other home-distilled liquors can cause blindness is rooted in truth, but it’s important to separate the causes of said blindness from the alcohol distillation process itself. When homemade spirits cause damage to the optic nerve the culprit is almost always methanol, cousin to the ethanol you consume when you toss back any glass of tipple. Methanol is a byproduct of alcohol distillation, but only forms in tiny, non-toxic amounts during regular distillation, and anyhow it is easy to separate and discard from the first few ounces of alcohol that drip from the condenser. These first few ounces contain other so-called “foreshots”–low-boiling-point compounds that come out of the still first. Methanol is among these compounds (others are acetone, aldehydes, and other undesirables) that impart unappetizing flavors to perfectly good moonshine. Any distiller worth his salt will discard these at the start, eliminating methanol (which also leads to nasty hangovers in small doses, by the way) from the equation.